Shaquille O'Neal is a Basketball player. 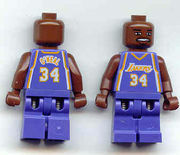 His number is 34, and his incarnation in LEGO depicted him in his Los Angeles Lakers uniforms. 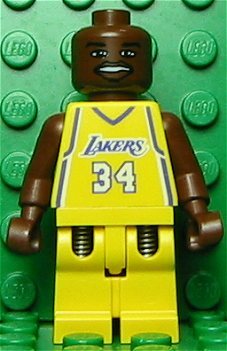 His fellow Lakers teammate, Kobe Bryant, was also made into a Minifigure. O'Neal is currently is 6th on the all-time scoring list with 28,605 career points, behind basketball legends Kareem Abdul-Jabbar, Karl Malone, Michael Jordan, Wilt Chamberlain, and Kobe Bryant. In The LEGO Movie, Shaquille O'Neal voiced his own minifigure. Shaquille O'Neal in The LEGO Movie. This page was last edited on 12 January 2016, at 23:50.